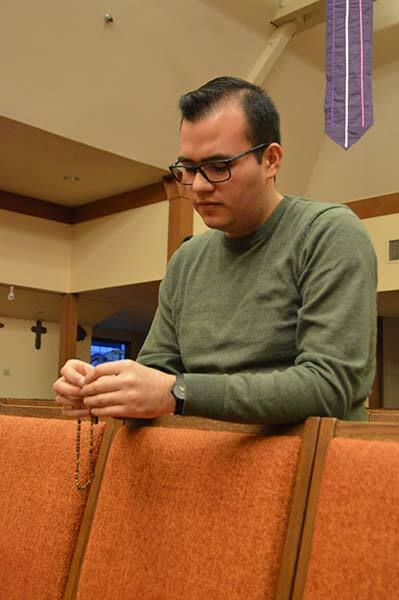 Carlos Garcia prays the rosary before Mass at St. Elizabeth Ann Seton Parish in Aloha. The 17-year-old is in the process of applying to seminary for the Archdiocese of Portland. James Ladd has had a long discernment journey. The one-time businessman found himself considering the priesthood after longing for a deeper connection to his faith. Their stories are diverse, but men who feel called to priesthood are united by a love of God and his Church. This path is not an easy one. Applying to become a seminarian for the Archdiocese of Portland is a serious process. Candidates must meet regularly with spiritual directors, get to know the archdiocese’s vocations director and complete the diocesan application, which includes a background check, a medical exam, a psychological screening, a written autobiography and interviews. Once accepted by the archdiocese in the spring, the men then must begin the academic application for Mount Angel Seminary. Only after successfully completing all of these application requirements can they begin their studies as seminarians at Mount Angel. To young men pondering their vocations, seminary candidate Dutch Knight says to not be afraid. “God wants the best for you,” says Knight, a student at Oregon State University. Carlos Garcia kneels at his seat while praying the rosary. He prayerfully awaits the Spanish Mass at his parish of St. Elizabeth Ann Seton in Aloha. This is the place where Garcia’s Catholic faith was rekindled. He is a senior at Aloha High School and is currently in the process of applying to be a seminarian for the Archdiocese of Portland. The 17-year-old speaks with passion about this Catholic identity, which has belonged to him since he was baptized and confirmed as a baby in Mexico. “This is where I belong. This is where I was called to be,” Garcia says of his faith. “I feel very blessed that I was able to regain that again,” he adds. Until a few years ago, he hadn’t been going to church regularly, but he did as a young child. He remembers his grandmother in Mexico teaching him to pray the rosary. By age 7, he had it memorized. As a child in Mexico, he ministered to the sick and served as an altar server. “Ever since that time, I knew that I loved my faith,” says Garcia. The teenager recalls his grandmother telling him that she knew he would be someone special for the church. After her death a few years ago, he felt a need to pray more and trust the Lord. He started going to church again and getting involved in the parish community. Garcia began sensing the Lord calling him to follow. An internet quiz led him to the archdiocese’s Office of Vocations and the archbishop’s discernment retreat. “I knew that the Lord was calling me to the priesthood,” recounts Garcia. Previously, he had never thought he would be a priest. This is a common theme among the candidates applying to be seminarians for the archdiocese next fall. Among some of the other men examining a calling to the priesthood are James Ladd, a 46-year-old former businessman; Dutch Knight, a 22-year-old student at Oregon State University; and Kyle Nielson, a 28-year-old lumber mill worker who previously spent time as a seminarian in New Zealand. Nielson was raised in Stayton. He grew up as a Catholic but never dove into his faith until he found himself in a faith formation program in New Zealand for five months in his early 20s. This was when his heart was opened to the idea of becoming a priest. 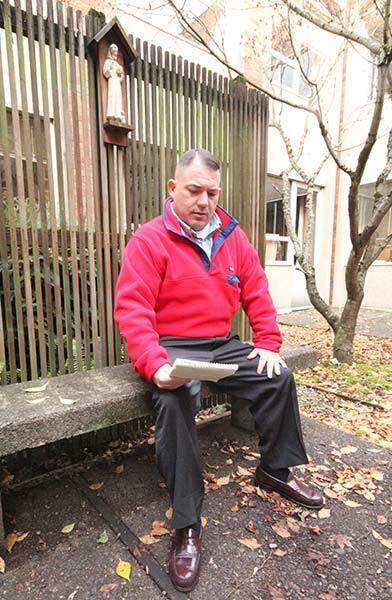 After returning to live with that same faith community in New Zealand, he entered their seminary. Still, he inevitably felt himself gravitating back to Oregon. Since his return, Nielson has had time to think thoroughly about his vocation. For some men, discernment is a journey and not a sign. But still, for others, the calling to the priesthood can be pinpointed to a moment. Knight came to OSU from Coos Bay. At the Corvallis university, he studies philosophy. As he was reading about the priesthood last summer, he was moved. “Why am I not a priest?” he asked himself. “It just looked so attractive in that moment,” says Knight. Despite feeling held back by a sense of unworthiness, Knight says he thinks God was revealing his will. The student says that since that revelation, he’s seen one confirmation after another encouraging him along this path. “It’s moving quite fast, but I’m very excited,” says Knight. While most stories of discernment happen to younger men like Knight, Nielson and Garcia, this is not always the case. Ladd grew up in Colorado and came to Portland in 1997 to work for an insurance brokerage firm in the downtown area. After shifting into land development, Ladd became a victim of the burst real estate bubble. He then took a job in customer service. As he got older, Ladd says his life was fine but something was missing. “That something missing was a real, deep connection with my Catholic faith,” he says. So he started reading and eventually contacted the parish near his Portland neighborhood, Holy Trinity. After working more with his parish priest and going on the archbishop’s discernment retreat, he believed he was taking the right steps in his discernment process. He signed up with the Office of Vocations to spend a weekend in March at Mount Angel Seminary, going to classes and living like a seminarian. He witnessed the election of a new abbot at Mount Angel Abbey and the weekend confirmed his decision to apply to the seminary. “It felt like home,” says Ladd. For Garcia, the decision to apply to the seminary has been a peaceful one.